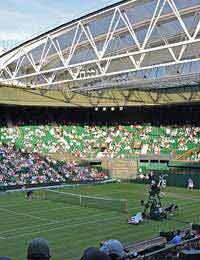 There's doubt about it, one of the most hotly anticipated events of the sporting calendar each and every year is The Wimbledon Tennis Championships - better known as Wimbledon Tennis fortnight. It’s as English as cricket on the green and is world-famous, steeped in history. It consumes countless TV viewers each year, glued to their television sets as the matches are played out before millions across the globe, but there’s nothing like seeing it in the flesh! The All England Lawn Tennis Club has always sold the majority of the tickets for Courts 1 and 2 and Centre Court in advance, but there are tickets made available through a draw, following a public ballot. Applications for the ballot for tickets for the following June can be obtained from the club from August, and must be submitted no later than December. The public ballot is always oversubscribed and does NOT guarantee tickets, merely a place in the draw. The draw is made at random by a computer and the successful applicants will have tickets assigned to them randomly – they will not have any choice over the day or court assigned. There’s another way to try and get tickets – you can simply queue up and hope for the best! Each day of the two weeks, except for the final four days, up to 500 tickets for Courts 1 and 2 and Centre Court are available for sale at the turnstiles for the general public. Prices vary depending on the day but can be around £30-£100. Aside from this, a further 6,000 Grounds Admission tickets are sold each day – and these are unreserved seating and standing space on Courts 3 through to 19, and standing space only in Court 2. You can end up standing in line for a long time and people often spend overnight camping and queuing. But it's great fun, you can meet new friends and share plenty of chat about your love of tennis! You’ll be given a Queen’s card when you join the queue with your number on to show your place in the queue, so hang on to that, you'll need it to be able to buy your ticket. Since 2008 it's now become possible to camp in Wimbledon Park overnight so that you're close to the queue in the morning. You'll be allowed to pitch there until 6am when stewards will wake you to pack up your tent etc. And there are toilets close by to the queue in Church Road and Wimbledon Park Road 24 hours daily. As with everything now, it’s possible of course to buy tickets online for Wimbledon fortnight using Ticketmaster. The best thing you can do to get ahead of the game here is register for Wimbledon email newsletters on the AELTC website. If you are a player or member of a tennis club, you may be eligible for entry into the Private Ballot draw. Enquire with your club for more info. There are a small amount of tickets available through packages with tour groups and through official corporate hospitality avenues. Only approved affiliates are permitted to sell these and you can find details of these on the AELTC website. These are tickets that are not wanted by the original holder and can be gifted or returned from May onwards. They are returned to the kiosk and can be worth looking for as an absolute last resort if you cannot get in by any other method!